The Taiwanese semiconductor industry is expected to have a shipment value of NTD 2.5 trillion (USD82.8 billion; USD 1 = NTD 30.2) in 2018 and grow by 8.1% year-on-year, slightly lower than the global average of 10.1%, according to Taipei-based, government-backed IT research institute MIC (Market Intelligence & Consulting Institute) at a press conference held on August 28, 2018. "This owes largely to the sustained IC demand for commercial models, the advancement in 7nm process, and a considerable growth in memory IC market," says Chris Hung, senior industry consultant and Deputy General Director at MIC. "Therefore, Taiwan's semiconductor is expected to grow steadily in 2018. 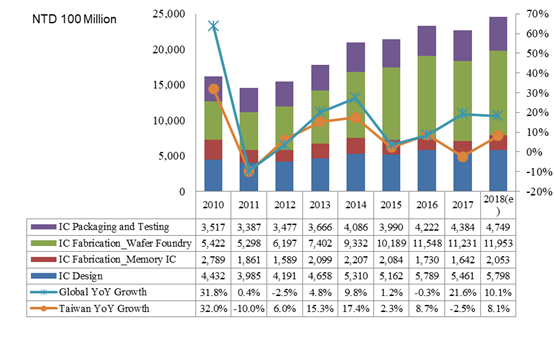 While the memory IC industry is to witness an exponential growth of 25% compared to 2017, the fabless IC industry is estimated at 6.2% and the packaging and testing industry at 8.3%. What is noteworthy is that fabless IC designers are expanding service coverage to include ASIC (Application-Specific Integrated Circuit). For instance, MediaTek starts to provide ASIC services for its clients like Cisco and Sony." To know more about MIC research findings, please visit our website. MIC Forum will last 4 days, bringing opinion leaders, industry leaders, and prospective enterprise customers together, and covering technology areas that are critical for the future of digital economy. The agenda will include presentations by Lu Fang-ming, President of Business Group of Hon Hai Precision Industry, Jason Tsao, COO of Microsoft Taiwan, Dr. Yang Ren-dar, Executive Vice President, Institute for Information Industry (III), industry consultants, directors, and analysts of MIC, as well as a main panel, to be hosted by Victor Tsan, General Director of MIC. All sessions will only be presented in Mandarin. Come and visit our event website at MIC EVENTS to know more!